Multiple sources in Washington politics said the governor intends to roll out his presidential campaign by the end of the week, testing his viability as a 2020 Democratic nominee. Gov. Jay Inslee is preparing to launch a candidacy for president, the first by a Washington politician in more than four decades and the first devoted chiefly to the issue of combating climate change, with an announcement expected this week. Inslee has foreshadowed his plans to run as a climate hawk in a recent round of national media interviews, saying he’s made a decision and could announce his intentions within days. Multiple sources in Washington politics said Inslee intends to roll out his campaign by the end of the week, testing his viability as a 2020 Democratic nominee while leaving open the option of seeking a third term as governor if his national candidacy flames out. Jamal Raad, an Inslee political spokesman, pointed to Inslee’s recent media interviews hinting at an announcement but had no additional comment Wednesday. Although he would begin a presidential campaign as an underdog who has not crept past 1 percent in early polling, the governor and his aides have said his singular emphasis on climate would help him stand out in a crowded Democratic primary field that already includes 10 declared candidates, with more on the way. Many of the announced candidates also have talked about climate, but they have emphasized other issues including universal health care and economic inequality, as well as a general repudiation of President Donald Trump. While in Washington, D.C., for a meeting of the National Governors Association over the weekend, Inslee told MSNBC host Andrea Mitchell to expect an announcement “shortly” and said he’d bring a new perspective to the 2020 race. “Where I fit in is, I would say that I have a unique position in having a vision and a willingness to say that climate change and our mission to defeat it has to be the number one priority for the next administration,” he said. That stance differentiated him from several members of the Senate who already have launched presidential campaigns, including Bernie Sanders, of Vermont, and Kamala Harris, of California, who have expressed reservations about ending the filibuster. Inslee would be the first sitting governor to join the 2020 race; former Colorado Gov. John Hickenlooper also has been exploring a run. 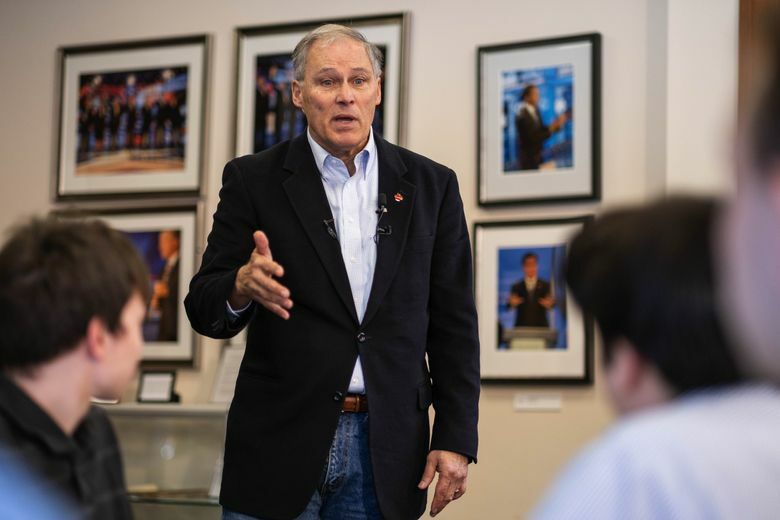 The call to climate action is not new for Inslee, 68, who has a record dating back to his years in Congress of blowing a bugle about the threat of rising global temperatures while emphasizing benefits of shifting to a clean-energy economy. He co-authored a 2007 book, “Apollo’s Fire,” that sounded similar notes to what Democrats are now calling the Green New Deal. As governor, Inslee has continued to promote ambitious policies to reduce greenhouse-gas emissions, but with limited results. The state has boosted electric-car infrastructure and devoted millions to clean-energy projects, but efforts to impose a tax on carbon have been stymied by the Legislature, and voters last fall rejected an initiative to impose a new fee on fossil-fuel emissions. The most recent Department of Ecology assessment showed carbon emissions continue to rise in the state. Inslee’s presidential aspirations have been apparent for more than a year. He elevated his national profile while traveling the country in 2018 as chair of the Democratic Governors Association, and he visited the early primary and caucus states of New Hampshire and Nevada last month. More recently, Inslee’s political circle has begun preparations for his expected announcement, with his longtime communications director Jaime Smith taking a two-week leave from her official job and his federal political-action committee, Vision PAC, advertising for positions. Lennon Bronsema, political director for Washington Conservation Voters, has signed on to the Inslee effort. Meanwhile, allies of Inslee last week announced formation of a federal super PAC, Act Now On Climate, that they said will support his candidacy if he runs. The group, which by law would operate independently of Inslee’s campaign, said it will not accept corporate contributions and will disclose its donors. If Inslee follows through on his candidacy for the White House, he would be the first Washington politician to seek the presidency since U.S. Sen. Henry M. “Scoop” Jackson, who ran for the Democratic nomination in 1976 but lost to former Georgia Gov. Jimmy Carter. Washington has no term limits, and Inslee has not ruled out running for a third term if his presidential campaign flops. He has had conversations with some Democrats who have been expressing interest in running for governor, including Attorney General Bob Ferguson, King County Executive Dow Constantine and Commissioner of Public Lands Hilary Franz. All three of those elected officials decline to elaborate on details of those conversations. But they sounded willing to give Inslee space, at least in the short term, to allow the governor to test his presidential prospects, saying they had no immediate plans to declare their own candidacies for governor, and they are content continuing in their current jobs. Seattle Times staff reporter David Gutman contributed to this report.